The Enchanted Robe is clothing in Splatoon 2. It is a 2-star item produced by amiibo and comes with the primary ability Thermal Ink. It is only available from the Octoling Girl amiibo. It cannot be ordered through Murch. The Enchanted Robe is a black witch's robe where the inside of the robe change color to match that of the wearer's ink only for females. The robe's appearance differs further for each gender; females have glitter on the lower part of the garment and a jewel neckline, while males have a longer robe with a pair of leggings underneath and have a turtleneck. 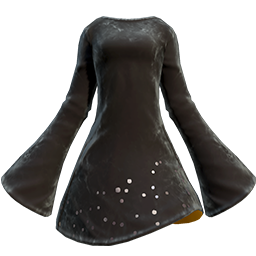 The Enchanted Robe comes with Thermal Ink as a main ability, which, being exclusive to the main slot of Clothing, prevents the wearer from also having Ability Doubler, Haunt, Ninja Squid, or Respawn Punisher. As a 2-star item, the Enchanted Robe has two additional slots for secondary abilities. Since it is made by the amiibo brand, it has equal chances to roll any secondary ability. This page was last edited on 8 March 2019, at 14:28.